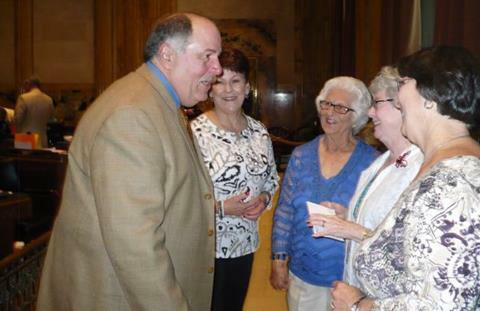 Several of us from Lafayette were met at the Capitol by a lovely group of ladies from Morganza. One of them had taken the day off from work to come. We were able to meet with many of our legislators, and they told us how much they appreciate our prayers. We were reminded by one of the representatives that their decisions affect the lives of many people so they need the wisdom and insight that it talks about in Proverbs and the rest of the Bible. One representative said that they could feel our prayers during a tough session. A legislator who had one of our postcards at his desk told us that he loved to get them; another said that the postcards remind them of Who is in charge. 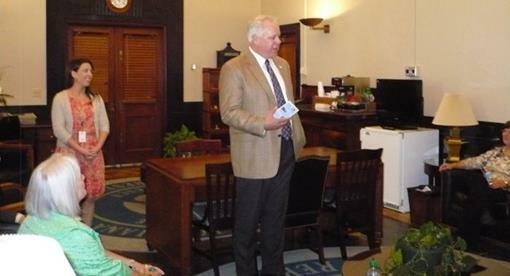 We were invited to the office of Chuck Kleckley, Speaker of the House. He met us in his conference room and thanked us for our ministry of prayer and encouragement. This was a refreshing comment when you consider all of the negative things with which they are being bombarded. The EAL volunteers had lunch together in the dining room and enjoyed getting to know one another. We were kindred spirits and left feeling that we had made some new friends. After lunch Rep. Nancy Landry had reserved seats in the House Chamber for us. She introduced us to the House body, and we received a warm welcome. We were happy to see the New Orleans’ style pralines we had brought being passed out and several legislators eating them. We met several more representatives and the chaplain, Dr. Ward, came over to greet us. We then gathered at the little chapel in the basement of the Capitol. We had a wonderful time of prayer. We lifted up our voices to The Great Lawgiver, praying for each lawmaker, by name, asking Him to give them wisdom and help. We had a fabulous time this year and hope that next year many more EAL members will be able to join us.